Harford's case histories are well chosen and artfully told, making the book a delight to read. But its value is greater than that. Strand by strand it weaves the stories into a philosophical web that is neat, fascinating and brilliant. Like the best popular science, it advances the subject as well as conveying it, drawing intriguing conclusions about how to run companies, armies and research labs. A good example is climate policy. 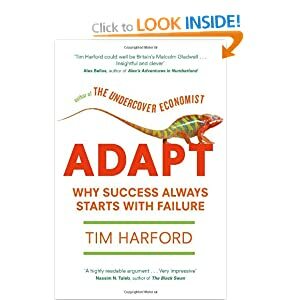 Harford shows how exhortations from on high to people to cut their carbon footprints, or winner- picking by governments for advancing certain technologies, is ineffective and counterproductive. Why? Because, he explains (citing chemist Leslie Orgel), "evolution is smarter than we are, and economic evolution tends to outsmart the rules we erect to guide it". A planning rule that forces British developers to install a minimum amount of on-site energy generation in new office buildings has led to the lunatic spectacle of convoys of diesel-drinking trucks taking carbon-rich wood from forests to biomass boilers in city centres because solar and wind power cannot meet the requirements on such small scales. high-risk systems as much as is feasible." by encouraging employees to spend 20% of their time on their own projects. Google's products, as well as its ideas, are designed so that they evolve by trial and error. Yet vast swathes of the world are resistant to the implications of this selective approach. Government agencies, academic institutions and financial behemoths are not allowed to fail. "Government regulations," writes Harford drily, "by their very nature, tend to be somewhat impervious to the possibility of improvement."